The blue band along the side tends to bend upwards in females. Mature females will be more full in the belly than the males, especially if they have become gravid. Use Java moss or a synthetic substitute over the bottom of the tank and reduce the lighting. Cardinals usually spawn at twilight. The male embraces the female when spawning and about 500 eggs are scattered among the Java moss. Remove the parents. The eggs hatch in about 24 hours and the fry are free-swimming in about five days. Feed the young on infusoria and later on, newly hatched Brine Shrimp. The Cardinal is not easily bred and most specimens are still imported from their native waters. The water in the breeding tank needs to be very soft and slightly acidic. 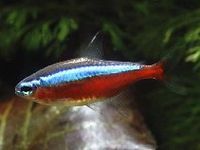 The Cardinal Tetra is a peaceful community fish that should be kept in groups of at least 6. Should not be kept with larger predatory fish. Will accept flake and granular foods along with micro pellet, supplemented with small live and frozen foods such as brine shrimp. Feed once to three times a day in small quantities. Cardinal Tetras can be quite a bit more sensitive than their cousins the Neon Tetra so should therefore not be kept in new tanks. Their tanks should be well matured (at least 6 months old) and they appreciated subdued lighting and some dense planting as well as open swimming space. The tank should be well filtered but without a strong current. Peaceful and a good community fish. Will school in groups of probably 6 or more. If less than 6 Cardinal tetras are in the tank they will school with Neon Tetras. Other fish use this fish as a spotter fish (dither fish). If there is a predator about, these fish will see it first; therefore other, more timid fish (for example, the Clown Loach) will come out into the open more if you put these fish in your tank. Useful to the aquarist as an indicator fish, if they are closely packed together then they are alarmed and feel threatened. Usually if they are settled, they will disperse over your tank. The fins have no colour and the upper-side is a brownish-red. A wide single stripe extends along each side of the fish from the upper parts of the eye to just below the Adipose fin. This stripe can appear sea-green, yellow-green or turquoise-blue, depending on the angle that the light hits it. Below this stripe is a wide bright Red band that can be seen on the lower half of the body , running from the underside of the mouth including the throat, and all the way back to the base of the Caudal fin. This fish is often confused with the Neon tetra, but in the Neon the bright red band is shorter, only running to the middle of the body. Is The Cardinal tetra an Annual Fish in the Wild?